For some students, achieving a top class ranking and taking the helm of the St. Mary’s Law Journal as editor-in-chief would be the ultimate triumph. Stephanie M. Green, St. Mary’s University School of Law Class of 2016, has attained those goals and pushed beyond. She has made increasing student engagement a focal point of her time at St. Mary’s Law. 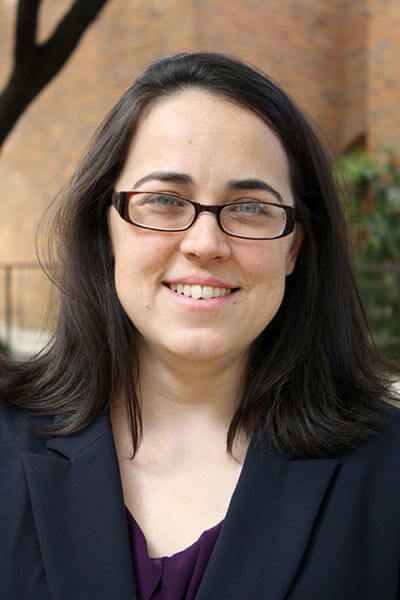 As chair of the law school’s Student Engagement Task Force, she and others on the task force advocated for reallocating a portion of the Sarita Kenedy East Law Library to become a collaborative space. Construction on the new Law Commons wrapped up this fall, and the area has rapidly become a popular gathering and studying space. Green is also president and co-founder of the Carlos Cadena Legal Dining Society, which began last spring with an inaugural dinner honoring Chief Judge Carl E. Stewart of the United States Court of Appeals for the Fifth Circuit. Green does all this while commuting several hours each day to San Antonio from Austin, where she and her husband are raising their two young children. Green has wanted to be a lawyer since childhood, but personal tragic circumstances sidelined her undergraduate education for a number of years before she earned a bachelor’s degree in political science from Texas State University in 2013. Despite it all, Green never fails to impress. After graduation, Green will begin clerking for Texas Supreme Court Justice Jeff Brown, and she would like eventually to practice appellate law. Green admits the task is not always easy.